A UN ultimatum for armed groups around Goma, capital of the Democratic Republic of Congo’s (DRC’s) North Kivu Province, to disarm, expired on 1 August and a security zone has been set up around the city. Goma is calm, but civilians, aid agencies and NGOs wait nervously as the UN's first ever "offensive" peacekeeping force prepares to fully deploy. "In North Kivu, MONUSCO [the UN Stabilization Mission in the DRC] considers any individuals who are not members of the national security forces and who carry a firearm in Goma and its northern suburbs an imminent threat to civilians and will disarm them in order to enforce a security zone to protect the densely populated area of Goma and Sake," MONUSCO said in a statement on 30 July, adding that the operation to enforce the security zone would, for the first time, involve its UN Force Intervention Brigade (FIB), a 3,000-strong international force mandated to “neutralize… and disarm” all armed groups in eastern DRC. According to MONUSCO, about 75 percent of FIB's troops - from Malawi, South Africa and Tanzania - are already on the ground; the brigade "will carry out targeted offensive operations in support of the Congolese army or unilaterally". Speaking to the press on 25 July, the brigade's commanding officer, Brig-Gen James Mwakibolwa of Tanzania, gave assurances that "Goma will never fall again as long as the FIB is on the ground. That’s the reason why the brigade is doing all in its powers through patrols to protect Goma and its environs." One of the first targets of the FIB is likely to be the rebel M23, mutineers who have been fighting the DRC's army, FARDC, since April 2012. "The removal of so many arms that have been used to terrorize civilians in the area should help reduce the appalling levels of human suffering but the UN must ensure that its operations do not make a bad situation much worse"
Since 14 July, FARDC and M23 have been fighting around Mutaho, Kibati and Munigi, on the outskirts of Goma. Already hundreds of thousands have been displaced in North Kivu and tens of thousands more have fled across the border to Rwanda and Uganda. Humanitarian agencies fear that clashes between FIB and M23 could cause further civilian suffering. "Oxfam urges the UN Peacekeeping force to proceed with the utmost caution as it enforces their call for disarmament and to ensure that civilians are adequately protected from any ensuing violence," Tariq Riebl, Oxfam’s DRC humanitarian programme coordinator, said in a 31 July statement. "The removal of so many arms that have been used to terrorize civilians in the area should help reduce the appalling levels of human suffering but the UN must ensure that its operations do not make a bad situation much worse." Médecins Sans Frontières (MSF) has expressed concern about MONUSCO's offensive mandate and the blurring of lines between humanitarian and military action. In a letter, Bertrand Perrochet, head of mission for MSF in DRC, urged MONUSCO not to deploy troops around its health facilities lest the safety of patients and staff be impaired. MONUSCO insists, however, that its mandate is not contradictory, and according to the media, spokesman Manodge Monoubai said the UN mission could not "fold our arms and allow armed groups to kill the population". The Congolese government has welcomed the establishment of the zone and the ultimatum. For its part, M23, which is not at present within the security zone, has denounced MONUSCO's actions. "We [will] stay within the area assigned us after retreating from Goma," M23's president, Bertrand Bisimwa, told IRIN. M23 briefly occupied Goma in DRC, and was ordered to withdraw during negotiations in Kampala brokered by the International Conference of the Great Lakes Region (ICGLR), which has been mediating in so far unsuccessful talks between the rebels and the government. Analysts say the success of the FIB will be dependent on how it responds to threats and how it deals with the local population. "The intervention brigade can be a force for good; however, it is crucial for it to interact with local populations in a transparent and open manner," said Rémy Kasindi, director of DRC think tank CRESA. 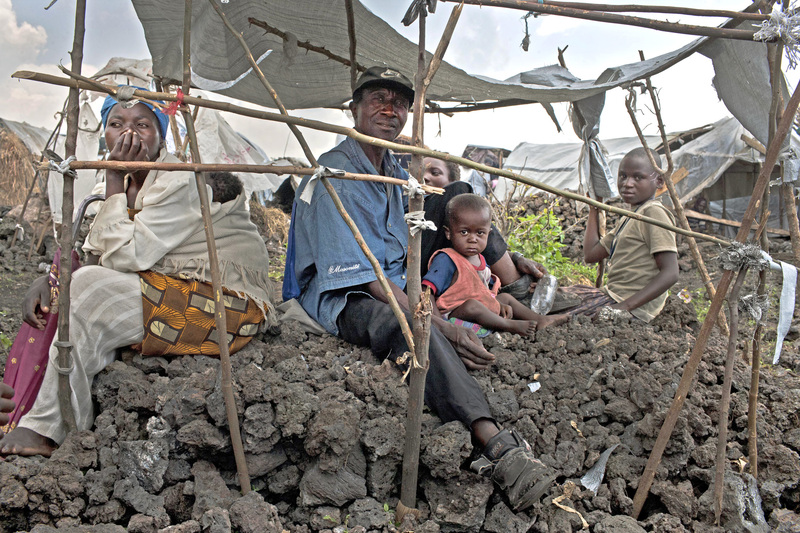 Others are more sceptical of MONUSCO's ability to protect Goma and its population. "Prior to M23's capture of Goma, we heard similar announcements and afterwards the city was taken over by the rebel movement," Ley Uwera, a local journalist, told IRIN, expressing concern about the delay in the FIB deployment - the brigade was expected to be fully operational by the end of July. "Most obviously, humanitarian actors will have to continue carefully to manage the need to coordinate with the peacekeepers while guarding their neutrality and independence… Much depends on [the FIB] establishing credibility at this early stage, and it remains to be seen how firmly the new brigade will respond when first tested." Chantal Daniels, Great Lakes policy adviser for Christian Aid, told IRIN that within the aid community, there is "hope [that] the security zone is a first step in a wider PoC [Protection of Civilians] and security approach". Alongside the military manoeuvres, a shaky peace process continues, with ICGLR heads of state recently meeting in Nairobi and reiterating their support for the Peace, Security and Cooperation Framework for the DRC signed in Addis Ababa on 24 February. However, on the sidelines of the ICGLR summit, diplomats privately told IRIN that many felt MONUSCO's ultimatum had dented the chances of a peaceful resolution to the crisis, sentiments also expressed by Rwanda, which has been accused of supporting M23, a charge it strenuously denies. "Whatever happens militarily, without strong political commitment it might lead to more tensions... especially if disarmament calls are not complemented by a new DDR [disarmament, demobilization, and reintegration] approach," said Christian Aid's Daniels.